As some of you may know, I’m partial to the “skinny” dogs. I adopted a retired racing greyhound while I was still in vet school and last year added a whippet to my fur-family. I’ll try not to be too biased in this week’s spotlight on Greyhounds. Sighthounds are one of the oldest types of dogs we know of. Carvings of greyhound-type dogs have been found in ancient Egyptian tombs dating back to 2000 BC. These thin, short coated dogs spread throughout Europe as a valuable hunting dog – known for their keen eyesight and speed. Lure coursing competition began with these sighthounds in the 16th Century in Britain and the dogs were brought to North America with incoming settlers. Greyhound racing as we know it today became popular in the 1920s in the U.S., England, and Ireland. 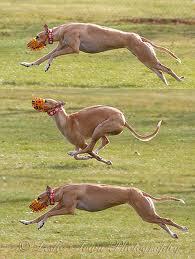 A greyhound in peak physical shape can reach sprinting speeds of up to 70km/hr!! Greyhounds stand 27” to 30” tall and weigh anywhere between 60-90lbs. Males can get significantly bigger than their female counterparts. Greyhounds come in all sorts of colours and colour combinations. Unlike most other breeds of dogs where there are fairly strict colour standards, pretty much anything goes when it comes to greyhounds. 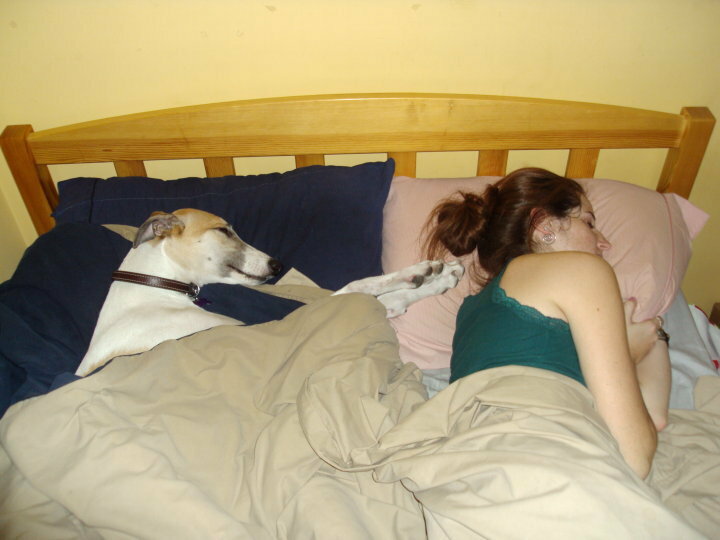 They are very gentle, loving dogs and here’s the big secret that every greyhounds owner knows: THEY ARE COUCH POTATOES! Everyone assumes that getting a greyhound means committing to a rigorous exercise plan, but it is quite the opposite. Grey’s are built for sprinting, not endurance. What they really want is to go out to a field or dog park, have a good sprint (about 5-10 minutes) and then hurry home and get comfortable on your couch… or bed… or pretty much any soft surface they can find except for the $100 orthopaedic foam DOG bed you just bought them. They sleep about 15 hours a day… adopting a retired racing greyhound is really more like adopting a very large, very bony cat. And as much as I love them, I’ll admit, they won’t be winning any intelligence tests. They were bred for speed… not brains. Oh, and you’ll have to make room in your coat closet for their winter wardrobe – they aren’t made for temperatures below 0. As for health concerns, they have a few. Greyhounds tend to have sensitive stomachs, so finding a food that works for them can be a bit tricky. Their more serious health problems stem from old racing injuries (arthritis) and they are unfortunately one of the most common breeds to develop bone cancer. Coming from the track, they can also have some behavioural issues to be aware of – separation anxiety is fairly common (but can usually be aided by getting them a friend! So, just go ahead and adopt 2 right from the start!) and some have a VERY strong prey drive. So much so, that some Grey’s cannot live in homes with cats or pocket pets. On a more personal note, this is my Grey – Desi. She’s my lovable goof ball. She can’t catch a ball, she’s the laziest dog I’ve ever met, and it took us over a year to get her to learn “sit”. Besides all that, she LOVES people, especially kids, and has decided that she would like to be Goldenvale’s front desk greeter. She loves going for a quick sprint around the pond with her sister and lets me dress her up in all sorts of ridiculous costumes for Halloween and our annual costume contest here at the clinic. PSA: If anyone is interested in adopting a retired greyhound (or getting more information) you can contact me, or look online for local rescue groups like After the Track or GiNA. Trivia: True. Australian Shepherds and most bulldog breeds are born with almost no tail. It is caused by a mutation in a specific gene in Aussies, so some can be born with tails, but most aren’t. In bulldogs, the tail twists up like a corkscrew, but it is so close to the body that it appears there is almost no tail! Question: Can dogs and cats sweat? Is this a True Emergency? © 2013, Goldenvale Veterinary Hospital.